For those of you who have ever gone into a casino, a Marco Island author has just published a book which you may want to read. 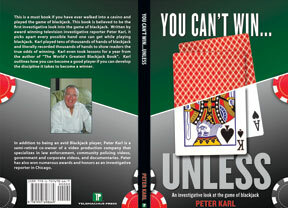 The book entitled, You Can’t Win…UNLESS, is believed to be the first investigative look at the game of blackjack. Karl no longer cares if he is not allowed to play in casinos. He thought the book was a good way to help regular players understand the odds and to give them some very helpful tips. Karl hopes to have a book signing on Marco and to meet with people to answer any questions they may have. “This book can save you some money and don’t ever gamble money you can’t afford to lose,” Karl warns. Those interested in reading his book, You Can’t Win…UNLESS, can order it on line at Amazon.com. It is also available in paperback. Karl is currently working on another book involving one of the most horrific homicides ever committed in the City of Chicago.